In 1977, Bev Larson had a dream. She wanted to help children with mild to moderate disabilities and emotional challenges learn how to survive and thrive in the world. Her friend, educator Barb Kralj, agreed and their combined vision created a partnership. It began with a preschool that integrated mainstream kids with special needs kids in the same classroom. Dr. Larson realized that bringing diverse children together provided a unique foundation of learning while developing such core values as acceptance, compassion, and understanding. “We always knew we would build a school,” said Barb. “The vision Bev had for education and taking care of kids and family—that was always her priority.” Through their work with parents whose children had developmental disabilities, they realized there were many in the community who had needs that were not being met. Together, they created Old Mill School, offering “A Special Education Experience” to all children. Bev Larson and Barb Kralj are considered pioneers in this field. Old Mill School was one of the first in the nation to use such a bold approach with children. Today, mainstreaming kids with a wide range of physical and emotional disabilities is a widely accepted practice in public schools. The community preschool program remains a cornerstone of Old Mill Center for Children and Families. 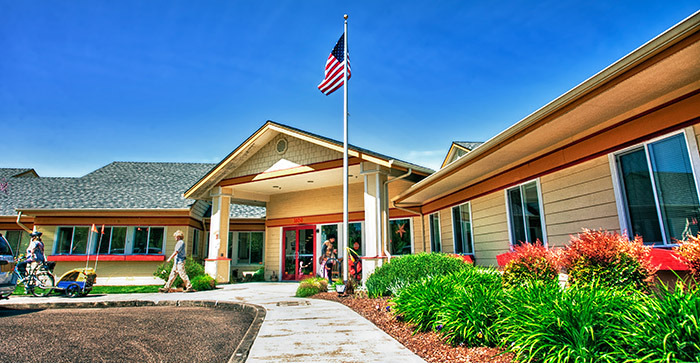 Old Mill Center has grown from serving eight families in 1977 to more than 800 annually in 5 distinct programs. In response to our community’s ever-changing needs, we bring together services that address the educational, social, emotional and family needs of a diverse population of children. The unique range and interaction of services allows Old Mill staff to provide multi-leveled, individualized and group support to at-risk children, from birth to 18, and their families. We are committed to providing critical services that would otherwise not be offered in the community. Dr. Larson passed away in March 2012 at the age of 67. Her legacy is staying alive with the children and families Old Mill Center serves and with the many families, children and staff whose lives she has touched.